Terms & Conditions - Debra Fallowfield makes custom jewellery to fall in love with … Crafting every piece entirely by hand..
Debra Fallowfield jewellery is made to the highest standard using quality materials. To prolong the life of your jewellery, so that you can enjoy wearing it for years to come, we ask that you take the time to review the care instructions (also in the FAQS on the website) upon receiving your jewellery. In the unlikely event of a workmanship defect Debra fallowfield will repair the item free of charge (excluding postage) for 12 months from purchase. Thereafter, we will be happy to repair your jewellery for a small fee. Please contact us to arrange this prior to returning your jewellery. We regret however, that any jewellery damaged as a result of not following the care instructions, must be replaced at the customer’s own expense. We will access every return individually. We do reserve the right to not accept a return and may require a restocking or repair fee if the item has been damaged. Each piece of jewellery is handcrafted using a wide range of materials. Each is handmade “one of a kind“and no two items will ever be EXACTLY the same .Debra’s style of work is quite organic and freeform and measurements whilst close may not be exact, gem colours and placement may alter slightly ,edges may not be perfectly straight- we believe in an imperfect beauty and this is what makes our jewellery SO damn special!! So whilst we do endeavour to deliver work as close to the images you see here please allow for small variations. If you have a problem with this style of jewellery please DO NOT order from us. Normally for custom orders under $1000.00 our deposit is $200.00 ,over $1000.00 a $500.00 deposit-or an amount decided by both parties. This deposit is NON REFUNDABLE once work has commenced. Please note that items sent outside New Zealand may be subject to import duties, fees and taxes. Any additional fees incurred are the responsibility of the customer. If you are unsure, we recommend that you contact the appropriate authorities prior to purchase. In the rare event an item is lost during shipping we will endeavour to sort out a solution suitable for both parties. 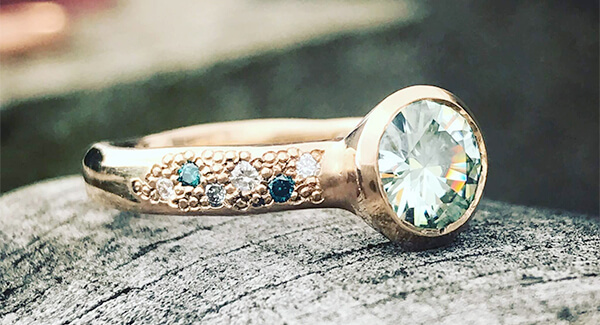 Please note there is no exchange or refunds on any CUSTOM MADE TO ORDER products, rings or sale goods , due to the handmade to order nature of our work we will access each return individually.Or if an item has been resized especially for you. * All exchanges will be made within 21 days of receipt of the returned item(s). Our address is 11A Constitution Street, Port Chalmers 9023, Dunedin, Otago, New Zealand.